Through his research, Jillion believes the Millennials sense that it is in their destiny to achieve greatness but may be having difficulty navigating within a divided America. It is Jillion’s belief that this generation will excel at bringing together the divisions within America’s population removing the old stigma’s and creating what he refers to as a “New Normal” for American culture. The author carefully explains the adventuring spirit that stirs within the millennials soul helping them to better understand their connection to their courageous ancestry. He proves through logic that immigrants coming to America today carry the same DNA as America’s founders and that the Millennials will greet them with open arms helping them to assimilate into American culture. Jillion attempts to remove political persuasion and carefully displays logically what he feels is a roadmap that will help the Millennials to better understand America’s government and the necessity to make certain the government works for the citizens and not an Elite class referred to as an Oligarchy (or ruling class). 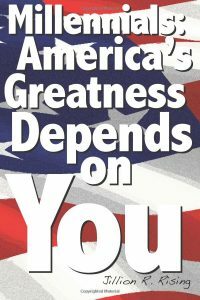 By presenting America’s past and carefully intertwining it into the Millennials future the author believes this book will speak directly to the Millennials in a way that not been done before.